Cognac Brandy by Black Bottle of Cognac, Brandy. Warming palate of currant fruit characters, anjelica peel and ginger, chocolateyness, honeycomb and vanilla. Aussie XO? You bet, it's a bit of an industry secret that Australian winemakers have had a long and propitious association with crafting bespoke, reserve stocks of the finest Brandy. 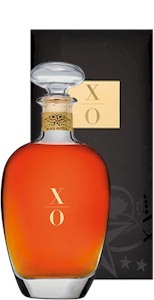 Black Bottle XO has accumulated over twenty trophy wins at national and international fine spirit competitions since inaugural release. A lingering, seemingly endless palate, resolving on a length of gentle spiced oak in support of the rancio fruit finish.